Corey Clement played 45 out of 82 snaps on Sunday. Over the first two weeks of the season, the Eagles had guys that you and I didn't know existed five months ago playing meaningful snaps in their offense. In Week 3, things settled down a bit, and the offense is beginning to look more recognizable. Analysis: Wentz and the starting five along the O-line played the entire game, which is particularly noteworthy for Peters, who was unable to finish each of the first two games. Analysis: Smallwood had good numbers, but I felt like he left meat on the bone on some of his runs. He could have had a bigger day. Clement is a clearly superior player, but it's difficult to criticize the usage of the backs this week without knowing how much Clement's quad was bothering him. As for Adams, it feels like he played more than 8 snaps. On the day, he had 6 carries for 30 yards. When he was in the game, he was usually getting the ball. Analysis: The Eagles utilized a lot of three-TE sets, which makes sense, given the current state of the wide receiver position. What exactly is Shelton Gibson's role on this team? The Eagles need a speed receiver who can take the top off the defense, which is what the they drafted Gibson to do, but he only played one snap in favor of guys like Aiken and Matthews, who both saw plenty of looks on the outside. Gibson has also lost his kick returning duties this season. Analysis: Dallas Goedert lives! And not only that, he had 7 catches for 73 yards and a TD. 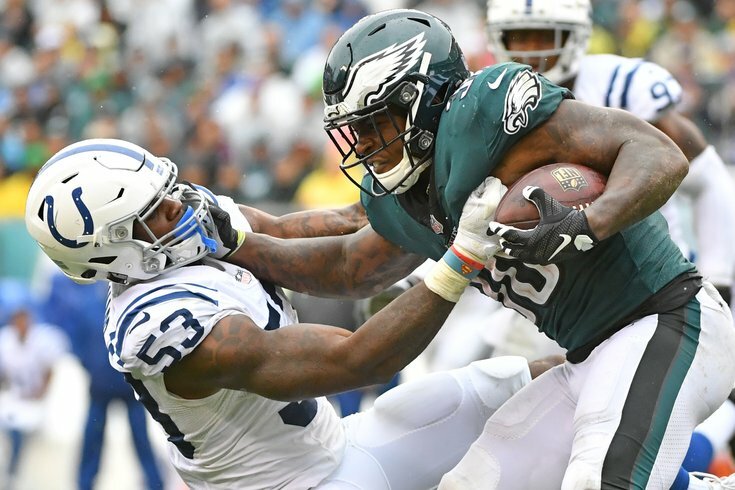 Analysis: The Colts only had 59 total offensive snaps, as the Eagles dominated time of possession, hence the low numbers on defense. Cox continues to play a ton, as he was on the field for 88 percent of the snaps. The defensive end rotation, meanwhile, is in full swing, as Barnett, Long, Bennett, and Graham all played around 60 percent of the snaps. Analysis: The Eagles stayed in nickel most of the day, as Grugier-Hill was on the field for just 15 percent of the snaps. Analysis: I didn't think Mills had a bad game, but the two pass interference calls on him are only going to increase the calls for Jones to start in favor of him. Analysis: McLeod hurt his knee. Otherwise, he never comes off the field. Regardless of McLeod's injury, Graham was used heavily in this game. With the Colts lacking a strong rushing attack, that approach makes sense.